Big changes are coming to Sharp, Corp. in the wake of their acquisition by Hon Hai Precision Industry Co – better known as Foxconn. News out of Japan notes that the deal between Sharp and Foxconn officially closes at the end of this month. According to both parties, the acquisition is proceeding smoothly and is fully expected to close on time. Executives at Foxconn are wasting no time in letting it be known that they plan on major changes at the struggling Sharp. First is that they will dismiss another 7,000 employees after the deal closes. This is on top of other rounds of layoffs already completed by the existing Sharp management. Second, Sharp’s President Kozo Takahashi will retire after the deal closes. Takahashi will be replaced by Foxconn executive Tai Jeng-wu. It was Jeng-wu who confirmed the additional layoffs to the Japanese media. The new head of Sharp told the media in Japan that he will “change the culture” of the century-old Sharp. “If Sharp is a kid, it is a rich kid who would learn better at school rather than at home,” he said. In the meantime, Foxconn CEO Terry Gou is also talking to the media – saying Sharp’s future is OLED technology. Considering Sharp’s significant investment in LCD – they virtually created the entire LCD TV industry – this is a dramatic shift in direction. But there’s one problem – Sharp currently possesses no OLED technology. 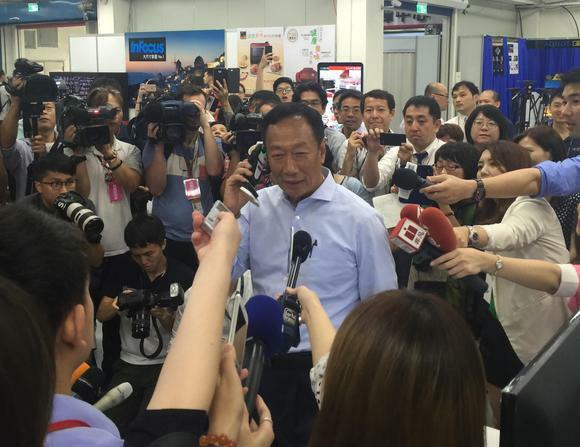 Foxconn CEO Terry Gou is very popular with the media. So even though Gou has already spent $3.5 billion to buy a 66% controlling interest in Sharp, he is ready to spend more to get the company back on track. Gou has boldly proclaimed to the media that they will be shipping OLED panels by 2018. “We will be ready before 2018 and ship (OLED panels) to customers,” Gou told reporters according to the Nikkei. Most industry experts say that Foxconn’s passion for OLED is because Apple has decided to utilize OLED panels in the iPhone, their most important product. OLED offers several advantages including sharper color contrast, greater efficiency, and even can be bendable. Interestingly, Foxconn will not confirm that their motivation for Sharp to get into the OLED technology is because they need it for their Apple business. 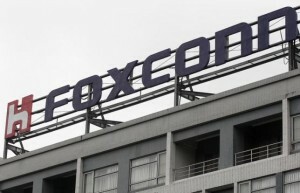 Apple is Foxconn’s largest customer. Foxconn’s financial reports show that Apple represented a shocking 50.3% of Foxconn’s total revenues in 2014. Last year, that figure rose to an even more dangerous 53.6% of their revenues. Apple has already contracted with Samsung – a Foxconn competitor – to buy OLED panels for their iPhones starting in 2017. Apparently, Foxconn wants to get this business back, and needs OLED capability to get it. And so Foxconn will invest another ¥200 billion ($1.9 billion) to help Sharp develop OLED technology. 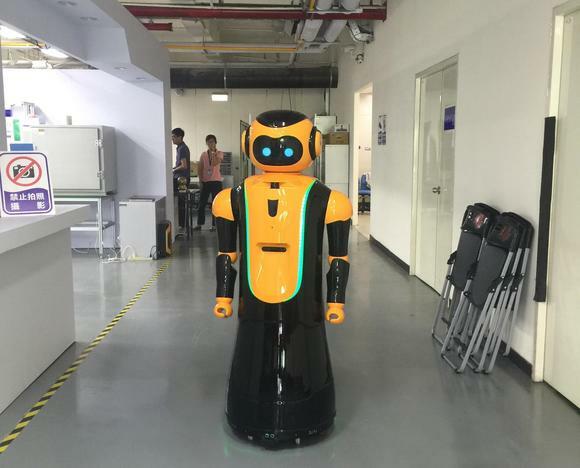 A prototype of a Foxconn robot in their lab. Beyond OLED, Foxconn has decided to retain Sharp’s solar panel business – good news for the employees in that division at least. 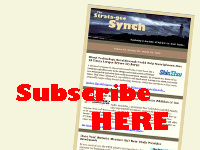 Sharp’s solar division has been on the bubble for quite some time now as it is losing money. However, Foxconn believes it can dramatically expand distribution into other countries including Taiwan, the U.S., and India. To accelerate the solar expansion, Foxconn will invest 15 billion New Taiwan dollars ($466.51 million) into the solar division. Gou said he will personally oversee Sharp’s solar division. Finally, Gou and Foxconn management has targeted two other major business segments for Sharp to pursue – robotics and automation technologies. As far as we can tell, by automation, Foxconn is referring to factory automation, as opposed to home automation. Although Sharp has already worked on a couple of robot projects, they appear to be in the very early stages there.